Deepen your connection to sacredness through heart-centered writing prompts, journaling tips, topics and examples. The practice of keeping a spiritual journal is a great way to cultivate sacred awareness. It can reveal the many ways you experience the sacred in and around you every day. 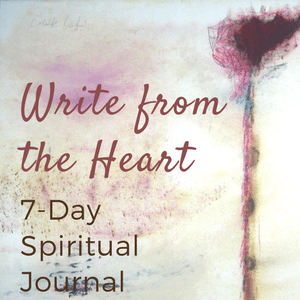 As you receive and work through these seven days of guided journaling prompts, allow your journal to become a companion, helping you to become more attentive and present to your daily life as a sacred experience. Keeping a journal can help you notice what feels truly important and meaningful in your days. Many of us struggle with surrender because we see it as defeat or giving up. It scares us. But true surrender is a path to freedom and inner peace. 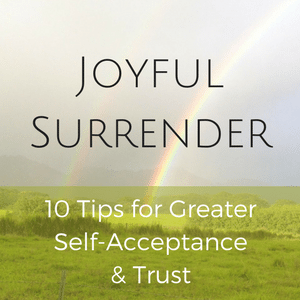 Surrender is a grace we open up to receiving, as well as being a practice—one that must be nurtured and cultivated through the choices we make, how we think, how we act, and what we hold in our hearts. From Colette’s book Comfort and Joy: Simple Ways to Care for Ourselves and Others. 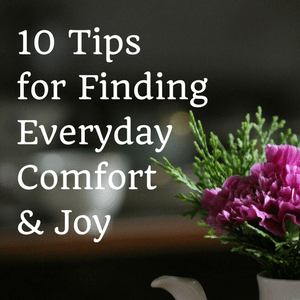 Discover how the simple moments in your day can nourish you with comfort and joy. In these ten tips, you will find ways to experience the sacred while taking care of yourself and others. This is a beautiful download filled with images and text to inspire you!